“The Autochrome process was the first fully practical single-plate colour process to reach the photographic public. It was easy to use. The plate was loaded into a conventional holder, glass to the front. The exposure was made through a yellow filter which corrected for the excessive blue sensitivity of the emulsion. A normal exposure for a landscape in summer, by midday sun, was one to two seconds at f/8, while a typical portrait exposure in a well lit studio would be ten to thirty seconds at f/5. The exposed plate was developed to a negative, and after a rinse the silver formed was bleached in an acid potassium permanganate solution. After another rinse the plate was redeveloped in the light to produce a positive. Fixing and washing completed the operation, although the dried plate was usually varnished for protection. 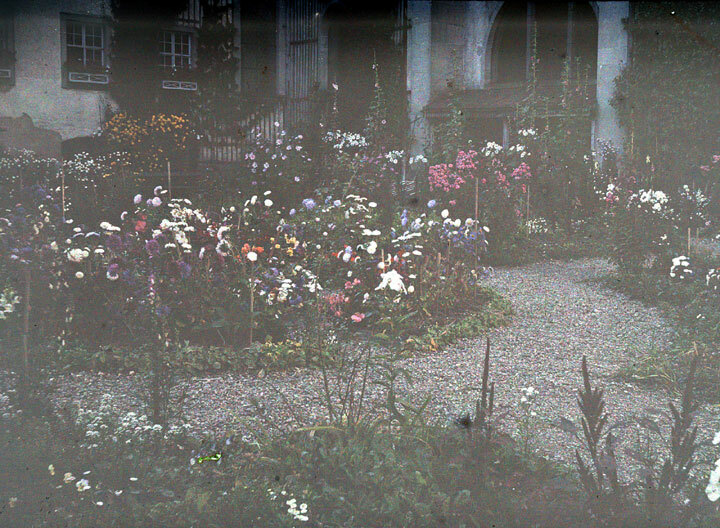 The Autochrome plate could record both saturated and subtle colours with fidelity, and since the screen and the image were combined, there were no registration problems. Nonetheless, it had drawbacks. The exposure times were long, and the processed plates were very dense, transmitting only 7½% of the light reaching them. 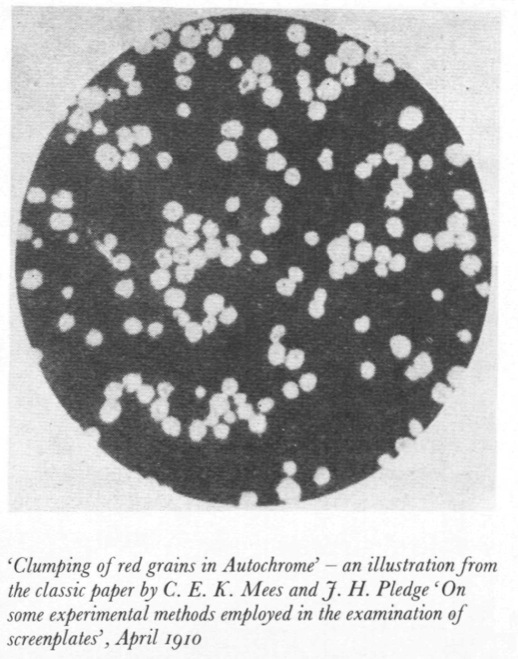 Although the starch grain filters were microscopically small – about four million to the square inch (620,000 to the square cm) – their random distribution meant that inevitably there would be clumping – groups of grains of the same colour. Probability theory predicted that in a square inch (6.5 square cm) there would be thirty-three clumps of twelve grains or more. In practice about fifty of such clumps were present in each square inch, and were visible to the naked eye. A further drawback was the cost. 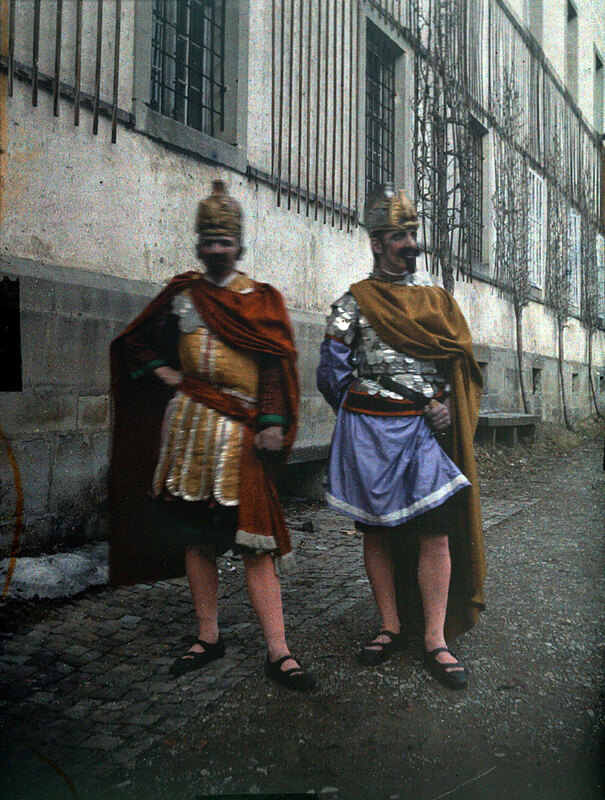 Bertrand Lavédrine; Gandolfo, Jean-Paul (2009): L’Autochrome Lumière. Paris: Editions du CTHS. Autochrome glass plates in the Klosterarchiv Einsiedeln, Switzerland. With over 72,000 autochromes, the Musée Albert-Kahn holds the most important collection in the world. “After overcoming various production problems the Lumières launched their new Autochrome plates in the summer of 1907. They were immediately successful. The British Journal of Photography reported in July, ‘The demand in France has been so great that there has been no chance of any plates reaching England yet, but as the makers are doubling their output every three weeks it will not be long before the plates can be obtained commercially in England’. In September they were able to report, ‘A few weeks ago, even in France… it was almost impossible to get an adequate supply… but… the disparity between demand and supply appears to have been removed’. The Royal Photographic Society awarded the Autochrome plates a medal in the Technical section of the 1907 Exhibition, and the Lumière brothers received the Society’s Progress medal in 1909. 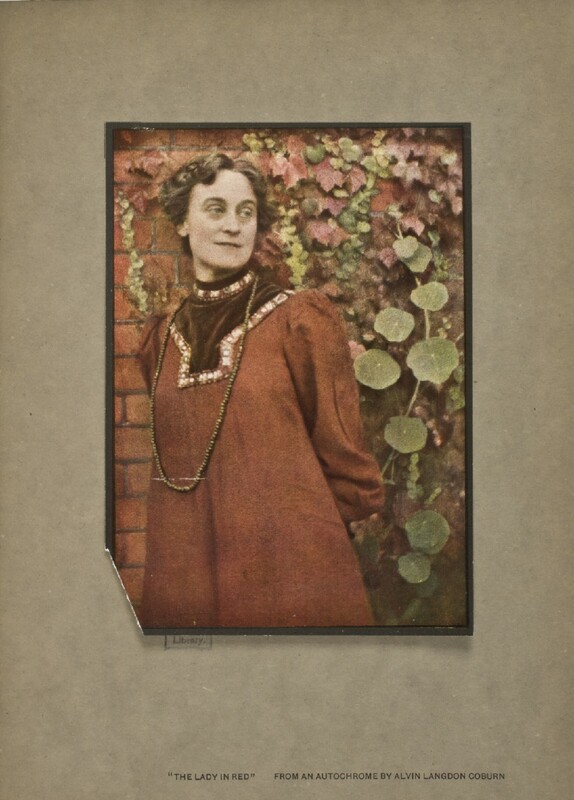 The Autochrome process was the first fully practical single-plate colour process to reach the photographic public. It was easy to use. The plate was loaded into a conventional holder, glass to the front. The exposure was made through a yellow filter which corrected for the excessive blue sensitivity of the emulsion. A normal exposure for a landscape in summer, by midday sun, was one to two seconds at f/8, while a typical portrait exposure in a well lit studio would be ten to thirty seconds at f/5. The exposed plate was developed to a negative, and after a rinse the silver formed was bleached in an acid potassium permanganate solution. After another rinse the plate was redeveloped in the light to produce a positive. Fixing and washing completed the operation, although the dried plate was usually varnished for protection. “Dusting-on Methods. – MacDonough also tried this: he coated the surface of a glass plate with a tacky varnish and then dusted on to this small colored particles, such as colored gelatins, shellac, or resins. Lumière Autochrome. About 1904 there was issued a French patent to the Lumière Company. This was for separating from potato starch the very small grains of the starch, sieving them to pick those of the same size and dividing the grains so obtained in three heaps, each of which was dyed in one of the primary colors; then mixing the three heaps together and dusting them on to glass plates covered with a sticky varnish; then squashing down the starch grains so that they touched each other all over the plate; filling any interstices that might be left with a black powder; varnishing; and then coating the plate with the necessary sensitive emulsion. This was accomplished successfully by the Lumière Company and the plates so made were issued as the “Lumière autochrome” plates, with which most of the color photographs known to the public have since been made. Since the starch grains were extremely small and uniformly distributed, the unexposed plate appeared colorless to the naked eye. Thus, upon exposure those colors present in the scene will become registered on the emulsion in the form of a darkened series of dots. After the negative is reversed and converted into a positive picture, these previously darkened areas will become clear. As the colored filter screens (grains) are permanently attached to the glass plate and are not affected by processing, subsequent projection of the completed positive (also permanently attached to the glass plate) will produce a natural color slide. The Dramatic Mirror’s “well-informed investigators” were correct in their assessment. The application of the Autochrome process was, indeed, impossible except under highly special conditions. The Lumière Autochrome process held great promise, but the excessive lighting requirements were never overcome. It was, however, an important development in that it fostered other experimenters to explore similar methods of color photography. 1 “The Invention and Development of Photography,” Scientific American, June 5, 1915, p. 531. 2 “Motion Pictures in Colors,” Scientific American Supplement No. 2033, December 19, 1914, p. 387. 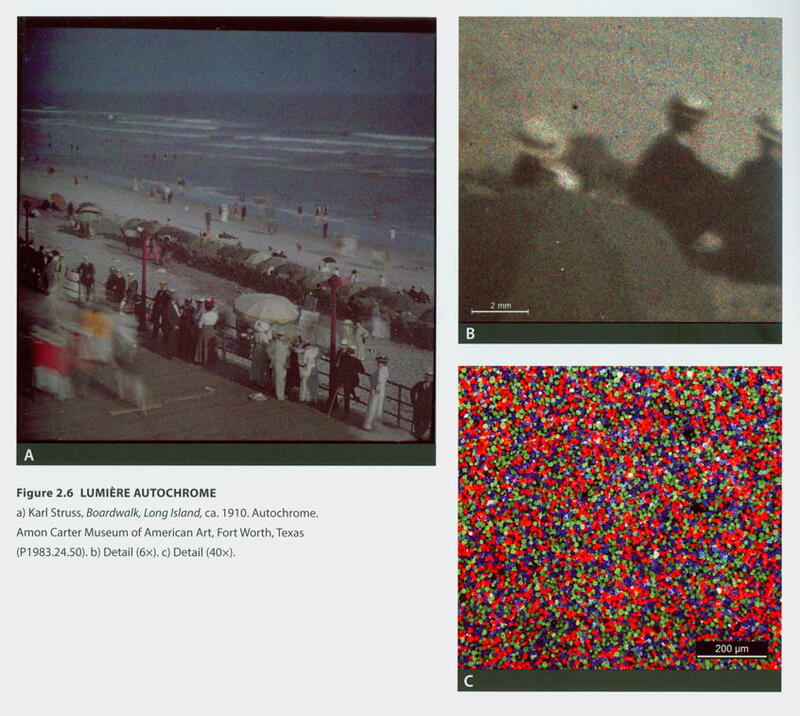 3 Glenn E. Matthews, “Processes of Photography in Natural Colors,” Journal of the Society of Motion Picture Engineers 16 (February 1951): 192-193. 4 “The Invention and Development of Photography,” p. 531. 5 “The Spectator,” The Outlook 96 (December 5, 1910): 767. 6 “Keep Your Eye on the Colored Pictures,” Dramatic Mirror 75 (January 29, 1916): 36. “THE USE OF THE LUMIERE SYSTEM OF COLOR PHOTOGRAPHY IN MEDICINE. In a lecture recently delivered before the Berlin Medical Society, Prof. C. Benda drew attention to the value of the Lumière process of color photography to the medical profession, and pointed out that the results it will lead to are essentially original. This process allows for the first time the natural colors of an object to be rendered with faithfulness by a method readily accessible to any photographer, and which hardly requires any more time than ordinary photographic operations, while the material used in this connection, though more expensive than ordinary plates, by no means involves any excessive outlay. After describing in detail the technicalities of the process, Prof. Benda demonstrated a set of plates illustrating the possible applications of the process to medical instruction and the demonstration of microscopical objects and samples of pathological anatomy. In the field of micro-photography the author has given special attention to such objects as do not lend themselves to direct micro-projection, viz., in the case of considerable magnification, and especially to those which cannot be rendered perfectly by ordinary photographic methods, either owing to their double colors or to their delicate shades. He demonstrates the efficiency of the method by his records relating to blood pathology, to tryanosomes and malaria parasites. Even objects so susceptible as spirothetes are readily photographed by the process. However, in the case of high magnification it is recommended to use very thin cross sections. “AUTOCHROMIE. Le défaut du chronochrome, c’est d’exiger un appareil spécial pour la prise des vues et un projecteur spécial. La reproduction des couleurs à l’aide du matériel ordinaire ne peut guère être espérée, actuellement, que d’une méthode analogue à celle que MM. Lumière ont si remarquablement appliquée à leurs plaques autochromes. Le principe en est très simple. Les trois images et les trois filtres sélecteurs utilisés dans les procédés trichromes sont remplacés par une image unique, divisée en compartiments étroits, en cellules microscopiques colorées les unes en violet, d’autres en vert, les autres en rouge. Dans la plaque autochrome, cette mosaïque est constituée par des grains de fécule teints et juxtaposés de manière à former une mince pellicule. Ce procédé fournit de très beaux diapositifs en couleurs pour la projection fixe. Aussi a-t-on songé à l’appliquer aussi aux projections animées, mais de sérieuses difficultés s’y sont jusqu’à présent opposées. L’interposition du filtre trichrome et d’un verre jaune compensateur, nécessaire à l’équilibre du coloris, absorbe beaucoup de lumière, en sorte que, malgré l’extrême sensibilité de l’émulsion, la photographie instantanée n’est guère praticable. L’absorption de lumière par les éléments colorés est encore plus nuisible à la projection : nous n’avons plus, ici, comme dans les procédés trichromes à images séparées, trois projections qui viennent s’ajouter sur le même écran ; nous n’avons plus qu’une seule image, divisée en minuscules éléments qui ne laissent passer chacun qu’un tiers, et même moins, des radiations composant la lumière blanche. Il faudrait donc accroître l’intensité du foyer lumineux à tel point que le film risquerait fort de s’enflammer. Enfin, le grain de fécule est invisible à l’œil nu, mais devient apparent à la projection. Toutefois, ce défaut serait très atténué par la distribution irrégulière des éléments colorés, leurs positions changeant d’une image à la suivante : il se produirait là une compensation analogue à celle dont nous avons parlé à propos du coloriage. “If we are shown a red square on a green background, we see it and that’s it. If instead I take a photograph, even with the most sensitive pigment, of the same red square on a green background, at best I will get an image with a square at a given level of grey surrounded by a background of a different grey level, darker or lighter for example, but the “colour” does not appear in the final image. How can it be recovered? In order to give an idea of the problem, let us remark that Ogden N. Rood in his text dating back to 1879, with a new edition in 1881, showed a total distrust in this solution. At page 76 Rood wrote: “We have therefore to consider this problem as not yet solved and today’s knowledge makes us rather certain that it will never be solved.” He also briefly mentioned an extremely complex method proposed in 1869 by G. Cross and Ducos de Hauron consisting in the “indirect” reproduction of colour by means of three negatives of artificially dyed gelatine so as to reproduce the natural colours of objects, but he also stressed the extreme complexity of the procedure. Also the hopes raised by Niepce de Saint Victoire’s chancy discovery in 1862 of oddly coloured but unstable images, were only an illusion. The “colours” seen on the exposed plate derived instead from complex interference processes due to the presence of silver grains in the plate layer and did not have anything to do with “natural colours”. The role played in this case by Edward Bierstadt is quite interesting; he advanced the hypothesis of modifying de Hauron’s method of dyed gelatine. It is interesting because Albert, Edward’s brother, was one of the most renowned “colourist” painters moving to America and certainly the problem of reproducing “natural colours” had been discussed by the two brothers (there is an odd discrepancy between the date of arrival in America of the Bierstadt brothers – 1857 – in the note by the Italian curator of Rood’s book, Mara Barzone, and the biographical information on Albert published in Francois Mathey’s American Realism, Idea Book, Portland House, New York, 1978, where it is said that he arrived in 1832. This is probably a mistake due to the fact that Albert came back to Massachussets, after stadying painting in Dusseldorf in 1858). Anyway, the brilliant solution of the photographic problem could not be found by any other but A. Lumière in 1907-1908. The root of the solution, which in reality was quite complex, is based on a given analogy with the retinal behaviour, obtained by incorporating in the process some pigments effectively colouring sun light, and whose feature as light diffusers combined with the real photographic reaction. The method is so clever and brilliant that it is worthy of a detailed description. Lumière started from the preparation of gelatine containing a great number of tiny potato starch grains. These grains were previously dyed in red, green and blue, and later mixed in the gelatine, producing a slightly transparent and opalescent substance. It appeared greyish white as the white light is partially absorbed but in “equal proportions” by the three types of grains. The remaining part of the light reflected and diffused would represent a perfectly balanced combination of the three wavelengths, and so it would appear white. Now it was necessary that each starch grain, whether red, green or blue, contained a given quantity of silver bromide. The gelatine would then be composed of microscopic and evenly distributed grains of the “three colours”, each capable of capturing light as they contain photo-sensitive products. The plate was then exposed to the image of a red square on a white background. Once the process is well grasped, it is easy to find a solution for any colour combination. Let us say that the white light is composed only of blue + green + red light. Therefore the white background is composed of the beams of these three types which would come into contact – but only in the background area – with the grains of each, darkening all of them. Therefore the negative will present as a background an area – a square frare, all black – because all the grains of the three colours have been touched by the light and each has released “its” metallic silver atom. Now let us see what has happened to the red central square. Here the white light has been absorbed only by the red grains which have each released their silver atom, while the green and blue ones have not been touched, thus staying still dyed in blue and green as before the plate was exposed. Now we have the complete negative, which will appear as a black frame surrounding a green-blue central square. In fact we are seeing the negative against the light by using sunlight. Where all the grains had darkened, the light passed through with difficulty, but did not get coloured, because the light still passing through was not absorbed selectively. Instead the central square, by being composed only of not exposed green and blue grains – as regards colour – took that green-blue colour. Let us move now to the printing process, using the same gelatine now coating a sheet of paper, and placing the negative, on which the gelatine was mounted, on a transparent support under a white light beam and see what happens. The black frame of the negative will block the white light and therefore all the red, green and blue grains of the positive will remain untouched. Instead, the central green-blue square will let pass these two colours (the red grains are not present as they have been previously blackened). In correspondence with the central square on the positive we will have a stream of green and blue beams, which will be absorbed by the green and blue grains which will darken, while the red ones will remain untouched as there will not be a beam darkening them. The result will be an image presenting a white frame (all the grains are untouched) surrounding a central red square (the green and blue grains have been darkened). Die Filmbezeichnung Agfacolor-Neu für den neuen Diafilm war ursprünglich gewählt worden, um diesen von seinen noch auf dem Markt befindlichen Vorgängern zu unterscheiden. Das waren die Agfa-Farbenplatte (1916) sowie die ihr gleichenden Agfacolor-Kornrasterfilme (1932) gewesen, die wiederum ähnlich wie die berühmte Autochrome-Platte der französischen Gebrüder Auguste und Louis Lumière (1907) mit feinen roten, grünen und blauen Farbstoffelelementen [Farbstoffelementen] vor der schwarzweißen Fotoschicht arbeiteten.11 Dieser so genannte Kornraster wirkte bei der Aufnahme und bei der Betrachtung der Platten und Filme wie Farbfilter, sodass die darunter belichteten “Bildpunkte” nach der Entwicklung bei der Durchsicht oder Projektion ein mosaikartiges Farbbild zusammensetzten. Es glich somit den pointillistischen Gemälden neoimpressionistischer Maler, auf denen auch winzige farbige Elemente nebeneinander liegen, um bei einem gewissen Betrachtungsabstand für die Augen ihres Betrachters zu verschmelzen. In der Physik spricht man bei diesem Effekt von der additiven Farbmischung. Die vor allem Ende der 20er bis Mitte der 30er Jahre verstärkt in Erscheinung tretenden Rasterverfahren stellten die technisch aufwendigsten Ausprägungen der additiven Farbfilmtechnik dar. Die Rasterverfahren verwendeten Schwarz-Weiß-Film mit einer speziellen Oberflächenprägung/-rasterung zur Aufzeichnung von Farbwerten. Der Vorteil von Linien- und Linsen- gegenüber dem Kornraster lag in der exakten Struktur der Filmrasterung: beim Linienraster die Anordnung der Farbstoffpartikel zu parallel verlaufenden oder einander kreuzenden Linien, beim Linsenraster eine Textur dicht nebeneinander liegender, linsenförmiger Segmente, die im Gegensatz zu den anderen Rasterverfahren keine Farbstoffe enthielt. Aufgenommen wurde auf Linien- und Linsenraster durch ein dreiteiliges Streifenfilter in den Grundfarben der additiven Farbsynthese Grün, Rot und Blau, das bei der Projektion wieder vorgeschaltet werden musste. 51 Vgl. Koshofer: Color, S. 31. 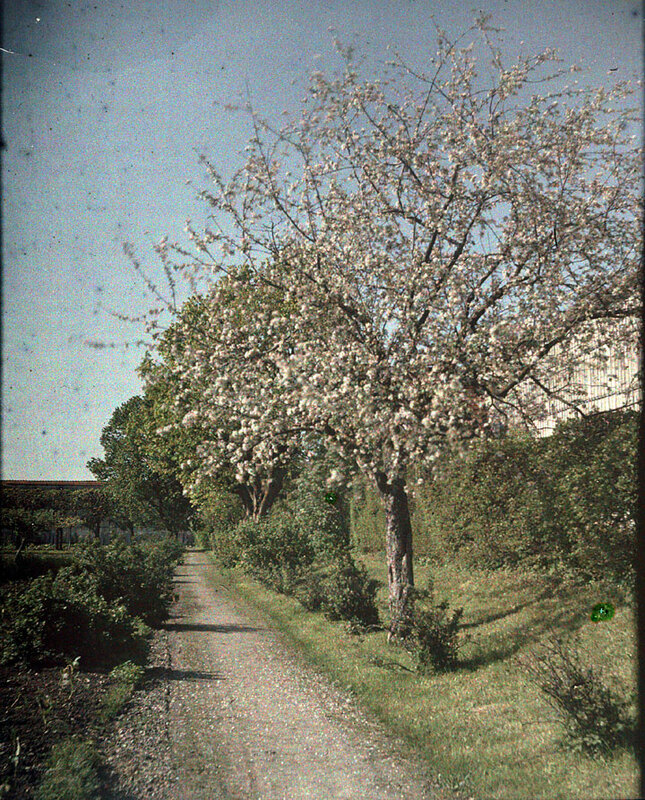 In 1904 Auguste and Louis Lumière, manufacturers of gelatin dry plate negatives in Lyon, France, took a different approach from the ruled color screen and obtained a patent for a screen with a random pattern of colored starch grains.6 The brothers launched the autochrome plate in 1907, after three years of troubleshooting production problems.7 Contrary to the Joly and McDonough systems, screen and photographic emulsion were combined on one unique glass plate in the autochrome. This eliminated the problems of uneven contact and poor registration between screen and image. The colored screen consisted of very fine grains of potato starch (measuring about 12 to 15 microns) dyed blue-violet, green, and orange-red and mixed in such proportion as to produce a uniformly gray powder. The mixture was dusted on a glass plate coated with a sticky varnish made of dammar resin and natural rubber dissolved in toluene. Interstices between the grains were filled by dusting fine lampblack powder over the screen. The plate passed through a high-pressure rolling press, which flattened the grains of starch and increased the transparency of the screen. The resulting screen was extremely fine, with 8,000 to 9,000 grains of starch per square millimeter (Lavédrine and Gandolfo 2009: 156). An isolating layer of varnish composed of nitrocellulose, dammar resin, and castor oil was applied on the screen before a silver halide emulsion was laid over it. 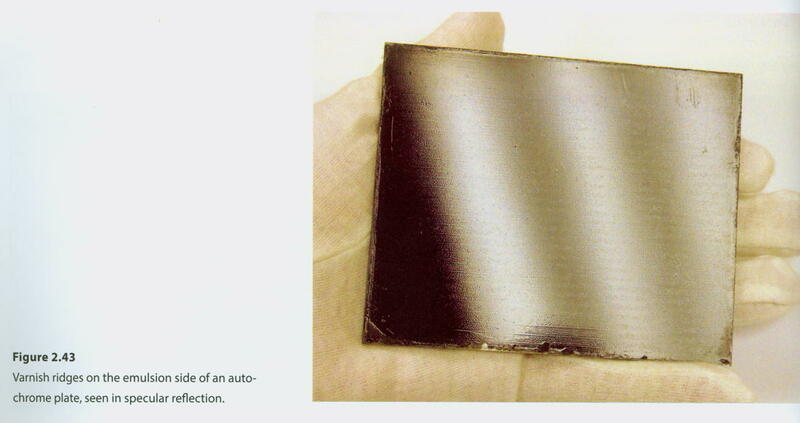 After exposure in the camera, the plate was processed in regular reversal black-and-white chemistry to produce a positive.8 The finished plate was then coated with a varnish and bound with a protective cover glass (Fig. 2.6). 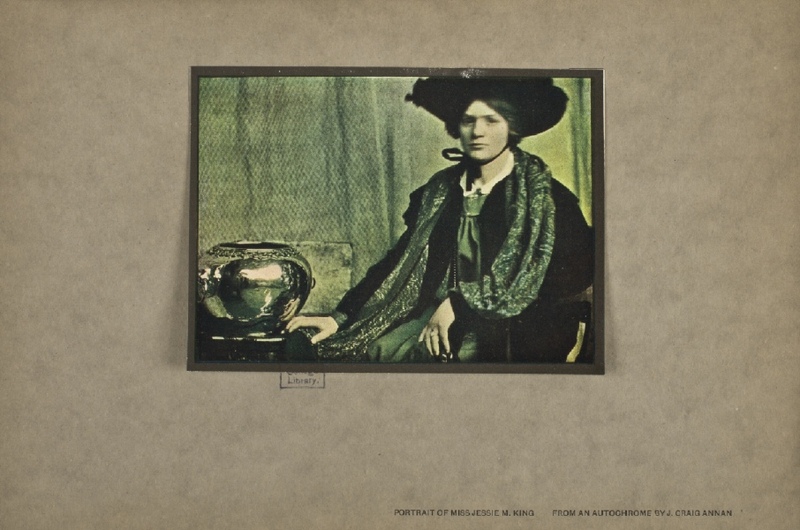 Autochrome plates met with immediate commercial success, and their introduction rocked the world of photography. At last, making a quality color image had become relatively simple, albeit still expensive.9 The demand was such that production at the Lumière factory had to be increased. “The possibilities of the process seem to be unlimited,” wrote Alfred Stieglitz (1864-1946) in Camera Work; he predicted, “Soon the world will be color-mad, and Lumière will be responsible” (Stieglitz 1907: 22). The major drawback of the autochrome was the screen’s high absorption of light, due in part to the use of black pigment to fill the interstices between the starch grains.10 The problem was highlighted in early descriptions of the process: “The autochrome plates are not very fast and do not allow, strictly speaking, the making of instantaneous pictures; therefore the cameras must be equipped with a tripod so that the plates can be exposed for a sufficiently long time” (Lumière and Lumière 1907: 360).11 Nevertheless, autochromes yielded the most perfect practical results, and no color screen plate marketed subsequently seriously challenged their leading position (Fig. 2.7). Autochrome plates remained popular until the Lumière Company introduced a line of films and discontinued their production in 1934 […]. 6 French Patent 339,223 (1903). 7 For a description of the challenges involving the production of autochromes, see Lavédrine and Gandolfo 2009. 8 Reversal processing: A method of producing a positive image directly on the film or paper exposed in the camera or under the enlarger. After development, the film or paper is bleached and given a second exposure of uniform white light (or is chemically fogged). A second development follows, which yields a positive rather than a negative image. 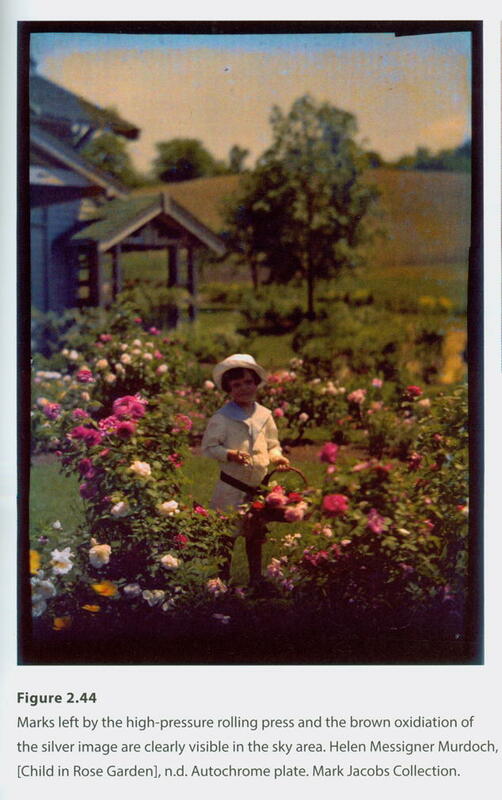 9 In 1907 one autochrome plate cost the same as twelve black-and-white dry plates of the same size. Abroad, they were at least twice the French price (Roberts 2007: 26). 10 According to Mees and Pledge (1910) about 92.5 percent of the light that reached the plate in the camera was absorbed by the autochrome’s color screen, compared to 90 percent for the Omnicolore, 88 percent for the Thames, and 79 percent for the Dufaycolor. Lavédrine, Bertrand, and Jean-Paul Gandolfo. 2009. L’autochrome Lumière: Secrets d’atelier et défis industriels. Paris: CTHS. Lumière, Auguste, and Louis Lumière. 1907. “Notice de MM. 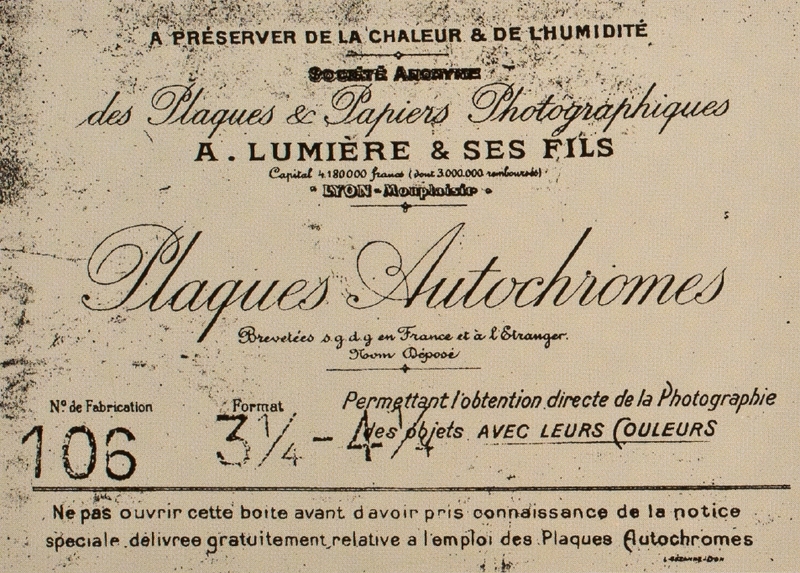 Lumière sur le mode d’emploi des plaques autochrome.” Bulletin de la Société française de photographie 23: 360. Roberts, Pamela. 2007. A Century of Colour Photography from the Autochrome to the Digital Age. London: Andre Deutsch. “Color screen elements may fade from exposure to light or even in the dark, which results in altered color balance of the image. For autochromes, violet is the most light-sensitive color, followed by red, then green (Lavédrine, Gandolfo, and Subsielles 1993). Green spots are often observed in autochromes; they are due to the penetration of moisture under the protective varnish that makes the colorants from the green starch grains bleed (Fig. 2.41). Screens may sometimes delaminate from their supports. 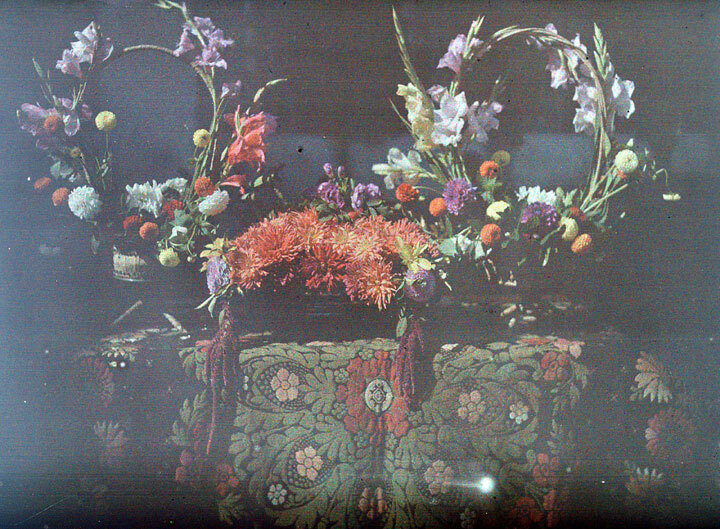 “The screen-plate processes, which had been attempted commercially by Joly and McDonough, reached the apex of success in the Lumière Autochrome process, in which the filter units were composed of dyed grains of rice starch, and with which beautiful color transparencies can still be obtained. Other screen-plate processes depended upon the use of dyed particles of resin or of regular screens made by printing bichromated fish glue or albumen. An application of the screen-unit process to film is provided by the Dufaycolor process, in which resist lines are printed mechanically upon a dyed cellulose base, so that the units can be bleached and dyed in different colors. “c. 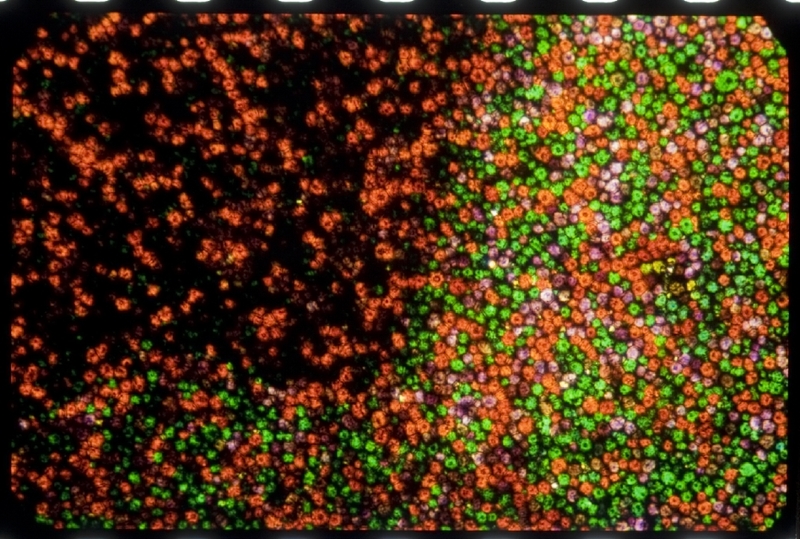 Les procédés à réseaux colorés: l’émulsion en noir et blanc est exposée puis projetée après inversion à travers un réseau filtrant placé à son contact: une mosaïque irrégulière de grains microscopiques colorés (l’Autochrome Lumière donna lieu à des essais d’application au cinéma dans les années trente sans suites commerciales); une trame régulière composée de fines rayures colorées (le Dufaycolor, en 1923; la Polavision à développement instantané lancée sur le marché en 1927 et rapidement abandonnée).